The variety of house plants you can grow indoors is amazing. 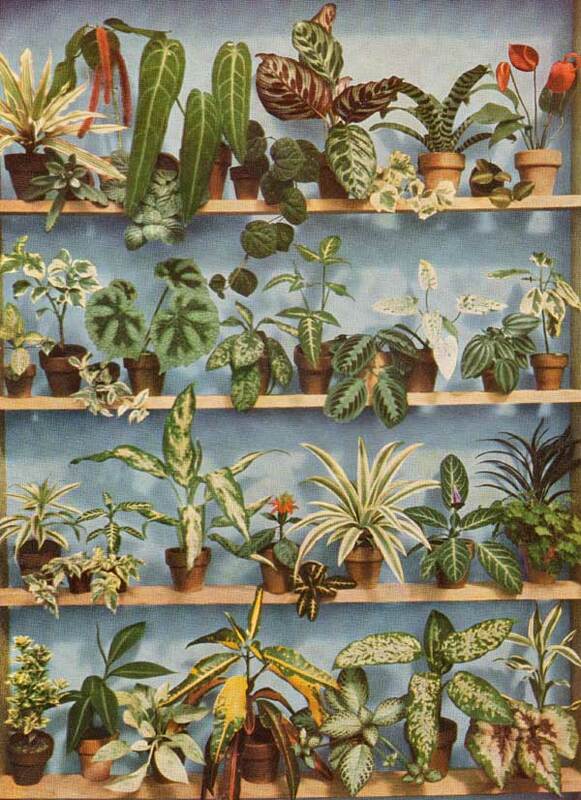 However, this article was written over 50 years ago and shows the true variety of houseplants people use to grow indoors and was available to them. The question is… do we have that same variety available today? You’ll notice that these indoor plants are small – no big floor plants. All small easy to place plants to add charm to any decor. You’ll find many still grown today but now take on possibilities – like cleaning the air in our homes. The post has a nice infographic with NASA recommended air-cleaning plants. Really, I am a lucky chap in having a wife who also likes plants. She never (well, hardly ever) complains when every window sill and every area near good light carries their quota of plants. It looks as though this grower of tropical plants will stir me up to such an extent that I shall be trying her patience once more. An amazing variety of house plants can be obtained today, some of them easy to grow and some a challenge to the most skillful lovers of house plants. For a time it looked as though, with the passing of the large estates, the collections of tropical plants that used to grace the greenhouses of the very rich would be lost to cultivation. But nowadays interest in “being green” has taken them on so that once more it is worth while for the commercial grower to stock them. It used to be said that the ease of travel which permits Northern gardeners to visit the tropics was a factor in the diminution of interest in tropical plants in greenhouses and in the home. I remember saying to my good friend, in the course of a trip which included several of the islands in the West Indies, that “it seems kind of silly to fuss and bother with tropical plants in homes and greenhouses when you see how much better and easier they grow in their natural habitats.” But it seems as though the factor is operating in the opposite direction – travelers see the plants in the tropics and as a result want to grow them in their homes. But let us return by taking a look at the four 5-foot shelves of plants shown below. For more than 30 years, I have advocated the use of bromeliads as house plants. The bromeliaceae is a family which includes such diverse-looking plants as Spanish moss and pineapple. I doubt very much if it is possible for anyone to grow Spanish moss in a Northern home, but the pineapple is comparatively easy although the chances of having it bear fruit are very slim. It is interesting, though, to grow it for its foliage alone and there is no difficulty whatever in getting a start. All you have to do is buy a pineapple fruit, cut off its topknot (you can’t eat this part anyway) and plant it in a pot containing sandy soil. But you will probably throw it away just as soon as you get a chance to get hold of the one on the third shelf under the name of Ananas comosus variegatus. This is much more impressive with its leaves beautifully striped in ivory and green with rose tinted margins. There is another variety Ananas comosus porteanus, with a yellow stripe down the center which, in my experience, is easier to grow. Other bromeliads pictured include two on the top shelf – Vriesia splendens major and Cryptanthus bromelioides tricolor. The last named is new to me but I am well acquainted with other members of this genus. Most of them are toughies. I remember that, when I worked at the Brooklyn Botanic Garden, occasionally small rosettes of C. zonatus would be knocked off, fall to the floor and get kicked into the gravel beneath the greenhouse bench where they continued to grow as happily as clams. This species is very striking; its leaves having undulating spiny margins striped with brownish green and pinkish cream. Tillandsia usneoides, Spanish moss, and other pineapple family species amaze us by their ability to thrive on nothing but air and water. Numerous species of tillandsia can be seen growing on telephone wires in Florida and the West Indies. One would think that plants that can thrive on such a lean diet would be easy to grow as house plants and certainly in a greenhouse where one can maintain the necessary high humidity. However, Spanish moss seldom thrives in the North. Fittonia Verschaffelti argyoneura is not too difficult to grow as a house plant especially if it is given the ameliorating influence of a terrarium. Whenever I see this plant I am reminded that, when we were living in Brooklyn, an old Italian who had charge of the orchid houses in Prospect Park told me that he was growing Fittonia argyoneura as a submerged aquatic. Thinking he was pulling my leg, I said I was from Missouri and loped over to Prospect Park one afternoon to see for myself. Sure enough, there were several plants of fittonia submerged in a shallow tank of water which occupied the center of the house to help humidify the air for the orchids which were growing on the stages above. He insisted they had been there for several weeks. The only Anthurium I have ever attempted to grow in our home is the one pictured at the right on the top shelf. This rivals orchids in the long-lastingness of its inflorescence. The actual flowers of Anthurium are very tiny, and are produced in succession on the spadix, which is the name of the slender curled part of the inflorescence. The showy heart-shaped structure is the spathe which serves as a “come-hither” organ. I kept tabs on one and it lasted three months before it faded. This plant belongs to the araceae, the Jack-in-the-pulpit family which is really noteworthy for the numerous species that can adapt themselves to home conditions. Among the genera which are well-known as house plants are aglaonema, homalomena, syngonium, philodendron, monstera, nephthytis, dieffenbachia, scindapsus and schismatoglottis. A word of warning perhaps is in order concerning the araceae, the juice of which contains calcium oxalate crystals which may cause trouble if anyone is impelled to taste them. A friend of mine told me that he was foolish enough once to taste a portion of the stem of dieffenbachia. This caused his tongue to swell so that he was unable to eat or speak for three days, which explains two English names of dieffenbachia: dumb-cane and mother-in-law plant. Another plant family which has a number of members capable of thriving under house conditions is the gesneriaceae which includes America’s favorite house plant of today, the saintpaulia, better known as African violet; and gloxinia, which the botanists tell us we now have to call sinningia. Others are episcia (the 4th plant from the right on the bottom shelf) and columnea. It is rather astonishing that these plants take so well to house culture, because they do not have the tough, leathery or waxy cuticle which used to be considered necessary for plants that we attempted to grow in the home. It is possible for some amateurs to grow better saintpaulias than professionals do in greenhouses. Another plant family, the begoniaceae, also contains a number of species which are amenable to house conditions. Some of these are easy to grow such as wax begonia, beefsteak begonia, and angel wing begonia, of which there are many varieties. A little difficult is the so called calla begonia which apparently does not like hot nights, the rex begonia, opposed to dry air, and Christmas begonia. Marantaceae is another family group which has great possibilities for house culture. There are two genera of marantaceae to be seen on the shelves. The one on the top is Calathea Makoyana on the shelf beneath it is a prayer plant, Maranta leuconeura Massangeana, which gets its English name from the prayerful position of leaves in the dark. The plant that really sends me in this collection is the-little anoectochilus, an orchid which I have not seen since 1910. This rare plant is grown primarily for the beauty of its foliage which resembles that of a glorified rattlesnake orchid (goodyera) commonly found in the woods in the Eastern part of North America. I can remember about 45 years ago seeing two or three species of anoectochilus growing in the Royal Botanic Gardens at Kew, England. (c) there may be casualties so that I shall have to get a new stock of plants. If I should decide to throw my hat over the windmill I would try to get these house plants: Cryptanthas bromelioides tricolor, Anthurium Warocqueanum, Calathea Makoyana, Anoectochilus Roxburghi (orchid), begonia Iron Cross (rex hybrid), Homalomena Wallisi, Philodendron Ilsemanni, peperomia Verschaffelti, Pleomele Song of India, Aphelandra Fascinator (A. squarrosa? ), Aphelandra aurantiaca, Chamaeranthemum igneum, Ananas comosus variegatus, Osmanthus ilicifolfus variegatus, Costas sanguineus, Episcia cupreata var. Acajou, Begonia rex var. Merry Christmas.